I was intrigued by a post on The Emergent Kiwi’s blog about Inking the Stations of The Cross. The full story is here. A pastor of a Montrose-area church recently challenged members of his congregation to live out their faith in an atypical way by getting tattoos that represent different Stations of the Cross, images of Christ’s journey from condemnation to resurrection. 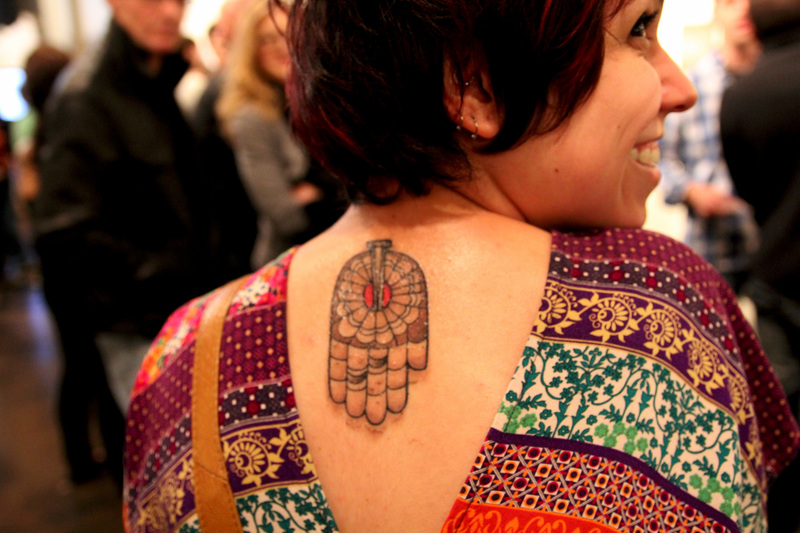 These faith-inspired tattoos are a great outward demonstration of a person’s inward faith. I’ve had a few interesting interactions around the idea of tattoos in the last couple of days. It would seem that there are still a lot of people out there who don’t like them or don’t view them as art. Cards on the table, I have tattoos and piercings – I think that has been noted once or twice by all and sundry. I have tattoos that represent my faith and I also have tattoos that are “decoration”. When I have more money (tattooing is an expensive business) I intend to have further tattoos to complete the look I want to eventually have. These will also include images that represent my faith as it is an intricate part of who I am. What do you think about this Stations of The Cross project that some members of the community in Montrose have become part of? I love tattoos and secretly would love to get one but have not yet ventured beyond the temporary type (I’m afraid it will just look as though I’m having a mid-life crisis!) I also like the idea that you can use them as a form of personal narrative. I’m less sure though about having something like the Stations as a tattoo – maybe because it seems to blur a number of boundaries? I saw a link to that book somewhere before. Absolutely fascinating artwork. Love it. Which boundaries seem to be blurred by the stations? I have a large cross on my upper arm. This could be said to be a station of the cross. On the blurred boundaries, I’m thinking out loud here but 2 possibilities occur to me – I suppose if I wanted to categorise them I’d say ‘representative’ and narrative. Thus something like a cross (or dove or trinitarian symbol etc) falls within a more general category of Christian iconography – so I don’t have a problem with that because one could see it as a straightforward symbol of identification with or allegiance to – a sort of ‘wearing my heart on my skin’ type identifier. However – and not sure if I can articulate this very succesfully as the thought is a little inchoate at present – representations of a Station of the Cross seem very much more specific – so what would one be saying with such a choice? A particular identification with a specific element of the story or a person in it? A personal identification with the suffering of Christ when he is whipped or stripped of nailed or..? And what would that mean? But if it’s not something like that, then it would seem to be that one is wearing it just as a ‘talking point’ (possibly because added shock value’ might give extra clout) – which doesn’t seem right somehow. I guess the issue of specificity segues into my second blurring: the Stations are so strongly narrative that I think it’s hard to get away from that aspect of them – but would one be giving a narrative of ones own life or appropriating that of someone else? I think I’d struggle to be able to wear one as a tattoo and claim it as somehow specifically representative of my own spiritual journey. I’m one of the people that commented on Robb’s Tattoos. When I was just beginning to get to know Robb I went up to him at the end of a lecture and said ‘Robb can I just talk to you about your tattoos?’ After the sharp intake of breath and him rolling his eyes he seemed quite relieved when I then followed with ‘I need to find a good shop to ink my custom design for my first.’ It spoke volumes about the negative ways tattoos are still talked about in the church. I know have three tattoos, all of which are signs of my faith and mark particular times in my life. My wings remind me of the moment during my treatment for cancer when I felt I was given a taste of heaven and stand as a contrast to the scars of surgery. My Chi-Rho shows that whatever else happens to me Jesus is under my skin and my most recent which includes the symbol for the Methodist church, the Alpha and Omega and Japanese clouds symbolises the trinity. It also shows the end and beginning of new ways of life and my devotion to my call. I got that one just after my ordination. Duttyo – I remember that moment. I’m used to zealous people talking to me about the bible without actually knowing the passages they’re referring to or what they say. Duttyo – your tattoos make sense to me as an expression of your own personal faith narrative in a way that simply sporting a tattoo of a station of the cross wouldn’t. And while there is perhaps a certain intrigue in the ‘group aspect’ – is this really anything different from other group tattoo occurences (such as members of a gang or the cast of a movie)? These faith-inspired tattoos [of Stations of the Cross] are a great outward demonstration of a person’s inward faith. doesn’t necessarily make sense in the way that it would if applied to your faith-inspired tattoos. Have you looked at the designs? There is something really patronising about someone considerably older than you saying you are doing something “unbiblical” when you quote that particular bit but they can’t. Pat, do you think that the tattoo in the picture I picked from the series is too specific? Hi Robb – very belatedly coming back to answer the question! Sorry for the hiatus. I found it easier to connect with the imagery in this project once I had been able to look at it more closely via the link I posted above. That said, I still have some discomfort with certain aspects of it. As regards the images themselves, I found them (as one might expect) a very mixed bunch. So there were a couple (3 and 6) that I really liked and which gave me a new window onto the particular stations they illustrated: If I were ever to contemplate being part of such a project, I’d maybe go for one of these. Some of them I found overly sentimental (and one of these also reminded me of a worship song which I hate for various reasons!) and some of them I found had too many things going on/gave mixed or muddled messages. I also have to say I think it is totally cheating to have a resurrection tattoo as part of a Stations sequence! However perhaps the most germane thing here is that I did find a couple of them (2 and 7), as you suggested, rather too specific to be easily translatable into one’s own narrative. However that is arguably also the case with some of the others too, so I think this may come down to a deeper discomfort with what they actually depict – which I think for me is organically linked to the way in which atonement theories of the cross have placed violence (and maybe in so doing have actually displaced the suffering they appear to be celebrating) right at the centre of the Incarnation narrative and thus (or so I would say) right at the centre of the dynamic of God’s own internal life as Trinity. For me, that represents a distortion of the gospel. So I guess that’s why I don’t like them and wouldn’t wear them myself as a sign of my own faith. I hope that makes some sort of sense of it! my immediate response is… i love this art project. 1. the community aspect. yep, a bit like a gang… but whether a gang is good or bad depends on what the gang is up to. i like the idea that the people in total make up the whole story. a bit like life or a microcosm of how groups work. it just seems to me that their is a real sense of people belonging to one another as well as belonging to the story. 2. the designs themselves. they seem to stand up individually very well. i didn’t see a design which made me think ‘eeuch’ that’s a bit gruesome on its own. there seemed to be a beauty about them all. a good example would be the tree which has been cut down to just a trunk base, robbing it of its beautiful height and colourful leaves. as a metaphor for the stripping of jesus i thought it was incredibly powerful and yet completely unsensationalist. 4. the theology. whilst i take and fully appreciate pat’s well expressed misgivings, i don’t think i share them. i think my take is that each part of the story has an importance, and it could be argued, a big enough importance to be viewed as a single image. i think it’s okay if somebody sports something uncomfortable… so much is about how that person relates it to the bigger story. i guess for a few hundred years now catholics haven’t been too keen on the free church empty cross symbol which denotes (i’m told) a ressurected christ, whilst baptists etc have found discomfort in the crucifix as a symbol which to them may glorify the violence and suffering too much. i have no problem per se with either symbol whilst i can also see problems with both. it would be fascinating to know who had what symbol and why… and how and where it fits in to their own personal story. maybe one day robb, if you’re feeling brave, you could post pics of your tats and tell your story through them. that would be utterly fascinating. great post and very interesting project i think we’re all agreed. btw… i love their art gallery space. would that more places were filled with this kind of creativity. it really was beautifully presented. this to me perhaps also helped me in seeing the authenticity, care and attention given to the project. My tattoos are not that spectacular. I have a cross on my right arm and a band on my left. I’d have more if I had money. They are an expensive business. The cross was the meaningful one. I made a comitment to being a lifelong follower of the way. Your 4th point is interesting. There are many who struggle to see a part without trying to define it as a whole. If we take each sentence we write as our whole understanding of God…. or one image as our whole understanding of God… or even all of our images/words/ponderings/imaginings/thoughts/encouters as our whole understanding of God then we will always have an incomplete glimpse of The Divine.